Big Brand and Big Heart? US Mega-retailer Walmart, seen by many small town business owners as an enemy to community and local business in general is working overtime to turn the tide of public sentiment. Store for Good is a program Walmart is developing in order to connect consumers with products that do good for other people, for themselves, or for our environment, and hoping to be seen as a good citizen on the way through. Plans for the Store for Good program include a range of eco-friendly products and healthier food options. The latest feather in the cap of the Store for Good program is a new initiative called Empowering Women Together, launched last week in time for International Women’s Day. Walmart have set aside space on its website to promote goods from small, women-owned businesses from around the world. At the time of launch on 07 March, two hundred items from nineteen businesses located in nine countries were available. Apart from the less than imaginative name, ‘Empowering Women Together’ is a bold reminder of the need for all brands, big and small, to connect with a greater purpose – something beyond their commercial reason for being. ‘Empowering Women Together’ features a number of female entrepreneurs, each with a unique story, but sharing an inspiring single-mindedness in their effort to raise themselves out of poverty. Each initiative employs other women, giving them a safe, fulfilling job and a way to support themselves and their families. “Empowering Women Together is a simple concept; it connects shoppers in the United States with quality products made by women-owned businesses around the world, And in doing that, it helps achieve so much more. Through Walmart’s Empowering Women Together, customers can help these suppliers increase their incomes, better their lives and create new jobs for others, and Walmart can help these suppliers gain experience with buying trends, scaling, product development and acumen they need to build their businesses.” Senior VP of Walmart, Andrea Thomas said in a press release. A glowing example of the program are sisters Joy Ndunguste and Janet Nkubana from Rwanda – a country with many widows, single mothers and orphaned children. 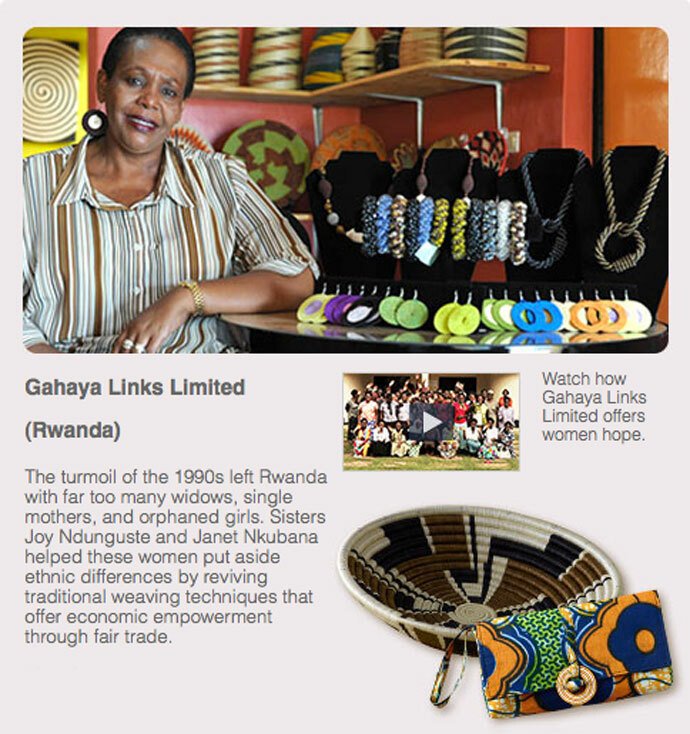 Ndunguste and Nkubana began a basket weaving collaboration that’s now grown into a sustainable business with more than 4,000 weavers creating baskets, items for home decor, jewelry and textiles that bring authentic Rwandan patterns to a global audience. Rather than trying to go it alone, Walmart’s strategy is to partner with experts who share the same goal, but have complimentary strengths. Walmart’s partners for the Empowering Women Together initiative are Full Circle Exchange and Global Goods Partners. Whilst it could be argued the positive PR benefit the retailer is generating for themselves from their involvement with the Empowering Women program outweighs the real benefits to the women themselves, it is better that a business leverages its brand for some good, rather than sitting on its hands. With Walmart’s massive international customer base and reputation, these female entrepreneurs are gaining worldwide exposure, and as sales grow, so-too will awareness, empathy and support. As with any large scale retailer, Walmart need to remain conscious of the impact they have on the local retail/supplier ecosystem to ensure their footprint is not causing more harm than good. As important as a greater purpose is for every brand, it must be genuine and authentic above all else.